Now that the Digital TV transition has been in place for six months, it appears that the convergence of the internet, video, and social media is ready to take off. In my 2006 thesis on Television Broadcasting Strategies for the 21st Century, I forecast that consumers would increasingly demand access to rich digital media anytime and anywhere, while foretelling the creation of broadcaster-owned internet TV portals, which we now see in hulu.com. I have also written about the effects of that convergence on the wireless industry, in my DIGDIA report: The Emerging 4G Wireless Landscape in the U.S.
"Helping Companies Find Digital Living Opportunities empowered by Digital Media". 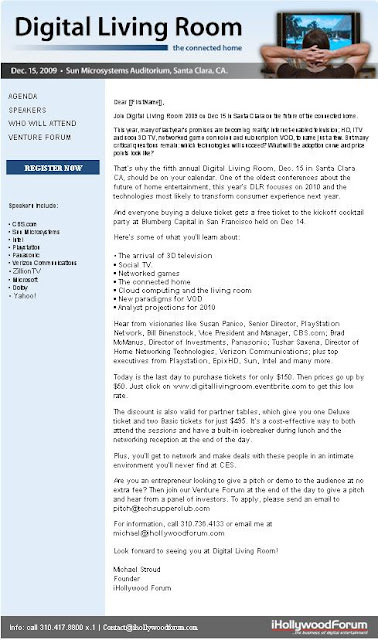 With that as our focus, I wanted to let you know of an event I will be participating in on Dec. 15 - Digital Living Room 2009. This promises to be a great opportunity to meet with leaders of the companies that will be bringing next generation devices and services to home entertainment. If you are in the San Francisco Bay area, I hope to see you there. If you can't make it, let me know what topics you would like to know more about. You can look for my report on visions for the digital living room in coming weeks.